A handy father took off the bottom half of the legs to surprise his 3 year old Christmas morning! This shortened trampoline is sure to please on Christmas morning. With small children, this is an excellent solution to play time during cold weather! 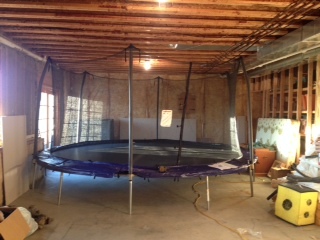 An indoor trampoline is not recommended for use by full-sized kids unless your ceilings happen to be 20′ tall. Thank you to Brandi W. for submitting this handy idea.